The CEO of the Australian Centre for International Agricultural Research - Prof. Andrew Campbell - addressed the APPG on 15 May 2018, with a speech titled "The converging insecurities of climate, food, water and energy: how to grow and share sufficient, healthy food more sustainably?" Prof. Campbell outlined aspects of ACIAR's new strategy, including the decision to allocate 20% of its budget to longer-term projects, lasting at least 10-15 years. "I asked colleagues about the best project they'd been associated with," said Campbell. "And there was a high degree of commonality in their answers. The best projects had a clear understanding of the problem, had the right people around the table, were well led, and had sufficient time and resources to make a difference to the problem. They also left behind sufficient capability to keep the work up, and ensure scale. "With the need to look at nutrition - not just yield - and the need to get serious about gender, we need to go further down the value chain, and involve the private sector. It's multidisciplinary and transdisciplinary work. Building social capital in these collaborations takes several years, and moving from formation to implementation takes years, and scaling up takes years. So unless you think in decades, you're doomed to failure." More information on ACIAR's new 10-year strategy can be found here. On 24 April, the APPG held a meeting on regional trade, as part of the evidence gathering process for a briefing paper on this topic. Just 5% of Africa’s imports of staple cereals come from other African countries. As the continent increasingly urbanises, demand for food is also rising, and individual countries cannot neatly meet that demand with production inside national borders. Cross-border trade is essential, and this can also provide farmers across Africa with greater opportunity and incentives. Capturing a greater share of domestic and regional markets could generate significant additional income for these farmers, and lift them out of poverty. But farmers in Africa face significant barriers in accessing the inputs they need and in getting their food to consumers in African cities. What are the major obstacles? One is transport and logistics services, which are patchy and expensive. Opaque trade policies, poorly communicated to farmers and traders, are another problem. Poor access to market information means many farmers also don’t know where the opportunities are. Border crossings can be difficult and even dangerous, particularly to women traders. A briefing paper on the topic will be published later this year. The APPG held a joint meeting on 21 March with the APPG on Science and Technology in Agriculture, based on the Policy Exchange report Global Britain, Global Solutions: How British R&D can transform international development. The Policy Exchange report argues for a doubling of the R&D component of the international aid budget to accelerate the humanitarian impact of our aid effort and as a boost to the British science base and its contribution to the Government’s Industrial Strategy. Using the report’s recommendations as a starting point for discussion, this meeting brought together a panel of expert speakers to consider the impact of the UK’s role in supporting agricultural R&D for development, and the benefits it delivers not only for smallholder farmers in developing countries but also for the UK agri-science base. A detailed report of the meeting is available on the website of the APPG on Science and Technology in Agriculture: click here. In a briefing to the APPG on Agriculture and Food for Development on 23 January 2018, CABI highlighted the threat Fall Armyworm and other global invasive species pose towards achieving the UN’s Sustainable Development Goals(SDGs). CABI’s CEO, Dr Trevor Nicholls, and Knowledge Bank Coordinator, East Africa, Dr MaryLucy Oronje, updated the meeting chaired by Lord Cameron of Dillingtonon the challenges presented by invasive species around the world, including losses worth billions of dollars which threaten Africa’s maize harvest unless Fall Armyworm is successfully brought under control. The presentations to the APPG came just a day after CABI launched the global Action on Invasives programme, funded by UK Aid and the Netherlands Directorate-General for International Cooperation(DGIS), which aims to protect and improve the livelihoods of 50 million poor rural households impacted by invasive species. CABI and its partners are seeking a $50m investment to coordinate the Action on Invasives programme and implement a multinational invasive species framework. 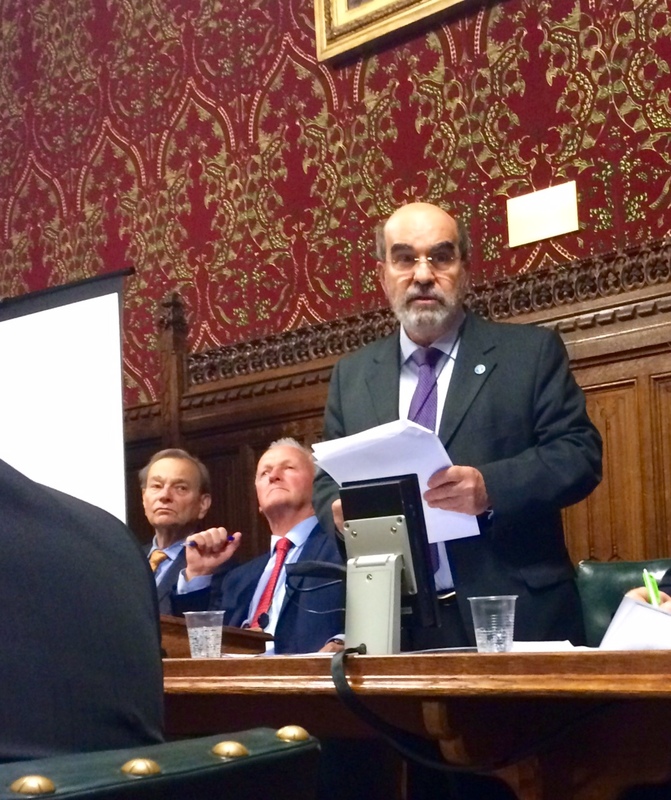 Jose Graziano da Silva, Director-General of the UN's Food and Agriculture Organization, addressed the APPG on 27 November 2017, calling for another Green Revolution - but not like the one of the past. "That model is exhausted," he told assembled Parliamentarians and members of the public. "We need to replace it with a friendlier approach - one that is less environmentally damaging, and based on knowledge rather than intensive use of inputs." Graziano da Silva pointed out that hunger still persists, with 815 million going hungry every day in spite of increases in production. Overall, there's already enough food in the world to feed us all, he said, but the problem is access at the bottom of the pyramid. "More than half of those 815 million are subsistence farmers who can't produce enough. Meawhile, another two billion people are overweight." 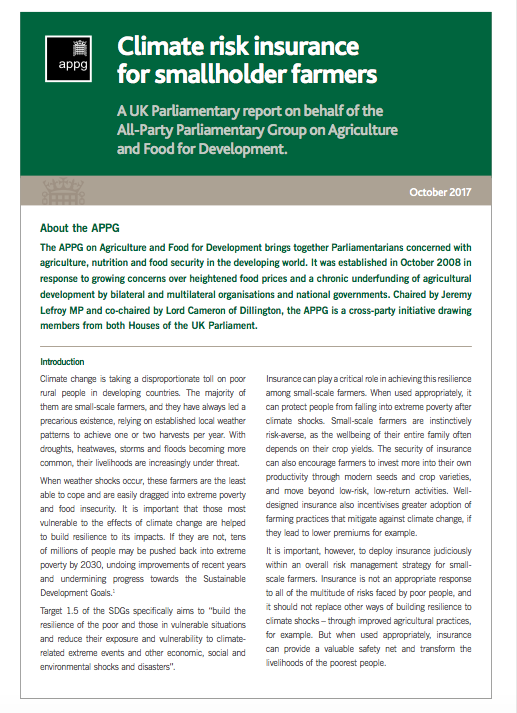 On 31 October 2017, the APPG hosted the President of the International Fund for Agricultural Development, Gilbert Houngbo. A former Prime Minister of Togo, Mr Houngbo took over from Kanayo Nwanze earlier this year. In his speech - "IFAD: Enabling rural communities to step up to the SDGs" - Mr Houngbo pointed out that rural people make up 40% of the world's population, but account for 75% of the poorest and hungriest. And it's in the most rural areas that you'll find IFAD doing its work, he said. "When you drive out of the cities, first you'll go past the embassies. A bit further out you'll find the NGOs. And when you're really far out, that's where you'll find IFAD." It's in these rural areas that poverty is concentrated, and that's where the agency's efforts must be focused, he said. "They are predominantly smallholders, and they are also the catalyst for economic growth." When weather shocks occur, smallholder farmers in developing countries are the least able to cope and are easily dragged into extreme poverty and food insecurity. It is important that those most vulnerable to the effects of climate change are helped to build resilience to its impacts. If they are not, tens of millions of people may be pushed back into extreme poverty by 2030, undoing improvements of recent years and undermining progress towards the Sustainable Development Goals. On Wednesday 12 July 2017 the APPG hosting the Africa Enterprise Challenge Fund for a briefing and discussion. Daniel Ohonde (COO) and Paul Greener (CEO) spoke to assembled Parliamentarians on the Africa Enterprise Challenge Fund as a development tool, its impact to date on rural poverty, and its future direction having recently been launched as a standalone entity after a decade of incubation within AGRA. The meeting covered the nature and impact of challenge funds in general, and AECF in particular. If agriculture is Africa's most promising route to prosperity, to what extent are challenge funds the way to get there? How do we assess their impact? How successful is the model in unlocking the potential of women farmers and young people? "Agriculture is critical and needs to be sustainable, creating income for more than one season," said Ohonde. "For example, we've supported 11 seed companies and made a difference to 600,000 farmers. The idea of focusing on the private sector is to ensure sustainability. The enterprises we support, in turn support an entire economic ecosystem." The Africa-based AECF was launched at the World Economic Forum in 2007 and began operations in 2008, when it launched its first competition. Since then, it has grown from a US$34 million fund to the current US$256 million Enterprise Challenge Fund that has supported 257 businesses in 23 countries and has reached over 10 million people across the continent. It funds businesses in a number of sectors, namely, agribusiness, rural financial services, communications systems, renewable energy and adaptation of innovative technologies to combat climate change. A lack of access to basic infrastructure is a major obstacle for rural smallholders attempting to improve their livelihoods. More than 620 million people in sub-Saharan Africa (two-thirds of the population) live without electricity and two thirds of rural Africans live more than two kilometres from an all-season road. Rural smallholders need better access to energy, irrigation, storage and transport infrastructure if they are to increase yields and participate in markets. 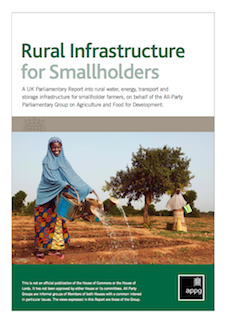 These issues are all explored in the APPG’s latest report, Rural Infrastructure for Smallholders. The APPG visited Uganda from April 1-5, 2017, with funding from the Commonwealth Parliamentary Association UK. Lord Cameron of Dillington, Kerry McCarthy MP and Patrick Grady MP joined the delegation. The visit included meetings with the Parliamentary Agriculture Committee in Kampala and DFID, as well as trips out of Kampala to see the work of HarvestPlus, World Food Programme, One Acre Fund and the Africa Innovations Institute.